I love my denim and chunky knits, but every now and then I miss the dresses I wear all summer. The great thing about fall is that dress season doesn’t have to end just yet. Today I’m sharing some cute fall dresses with you and giving you some tips on how to wear these as it gets colder outside. 1. OTK boots are a must. To keep your legs warm and transition your look to fall, over the knee boots are the best. I love mine from Steve Madden so much that I have them in taupe and black that way all my bases are covered. These also work well with skirts. 2. Sweater dresses are in. Sometimes, I find that these can be oversized on me so I utilize a belt to give me some shape. OTK boots also work well with sweater dresses. 3. Long sleeve maxi dresses are perfect for fall weddings. I get a handful of messages a week about what to wear to these ceremonies that turn into parties on the dance floor. You don’t want to freeze or be underdressed so what’s the best answer? I tend to suggest long sleeve maxi dresses because they are wedding and weather appropriate. The one I’m wearing here is from Style Collectif. 4. Use sweaters as a layering piece. When in doubt, layer with sweaters, cardigans, or moto jackets. Whatever layer you prefer based on the vibe you’re going for or the dress you’re wearing, layers are a great solution to the chill in the air. I like to wear cropped sweaters or jackets with dresses so that I don’t completely cut my height off which is easy to do when you’re 5’1”. 5. Try long sleeves under jumper styles. This is one of my favorite styles of the season and it’s so easy to do. Use long sleep tops or bodysuits under a jumper dress to keep you warm. 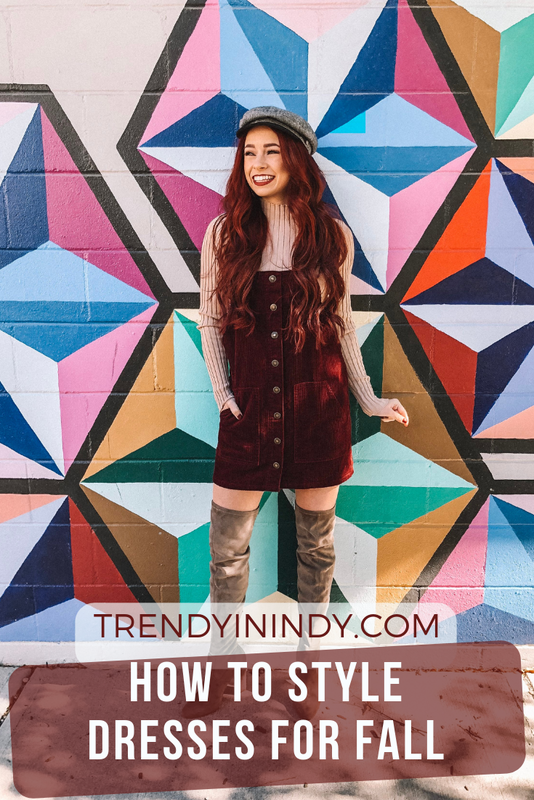 If you guys love cute fall dresses as much as I do, hopefully these style tips will help you.